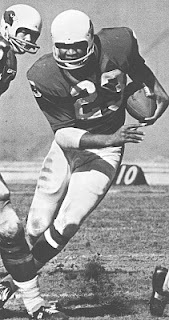 A star on both offense and defense in college, Roland was chosen by the Cardinals in the fourth round of the 1966 NFL draft. While there was talk of putting him at safety, he was utilized at halfback on offense where his outside speed and pass receiving ability could be put to best use. Cardinals went 8-5-1 to finish fourth in the NFL Eastern Conference. Roland followed up his outstanding rookie season with another Pro Bowl year in 1967. He rushed for 876 yards and 10 TDs and caught 20 passes for another 269 yards and a score. However, in the next to last game he suffered a knee injury that required surgery and, while he played for another six years, never again approached his early level of performance. His highs for rushing attempts and yards during the remainder of his career were 138 and 498, respectively, in 1969. In 1972, his last year with the Cards, he reached career highs with 38 pass receptions for 321 yards. Altogether with St. Louis he rushed 962 times for 3608 yards (3.8 avg.) and 27 touchdowns and caught 131 passes for 1240 yards and five TDs. He spent one last year with the New York Giants in ’73, gaining 142 yards on the ground and 190 yards on 22 receptions. With two punt returns for scores, he had a total of 36 TDs.